I have this habit of collecting quotes from nice books. I keep underlining nice lines that I find in each of the books that I read. Then I make notes out of it. (I know, most people find it annoying to read the same book after I’m finished with it.) But I keep losing these notes on a very frequent basis. 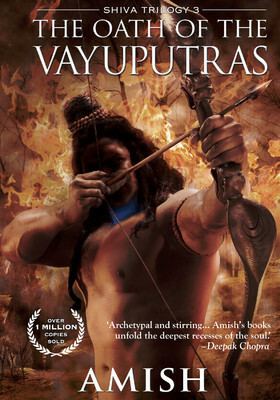 Today I came across one such note from this incredible book that I read last summer – The Oath Of The Vayuputras by Amish Tripathi. Here’s a small list of nice lines that I found in the book. A lot of people are capable, Neelkanth. What makes capable person truly dangerous is his conviction – Gopal. Often, our immediate reaction to a sudden crisis helps us save ourselves. Our response to gradual crises that creep up upon us, on the other hand, may be so adaptive as to ultimately lead to self-destruction. (The Frog in the hot water cup story) – Ganesh. “Shreyan sva dharmo vigunaha para dharmat svanushtitat” It’s better to commit mistakes on the path that one’s soul is meant to walk on, than to live a perfect life on a path that is not meant for one’s life – Parvateshwar. Nobody in the world, not even God, can tell us what our duty is. Only our soul can can – Parvateshwar. It is attachment that makes people forget not only their moral duties but even who they really are – Shiva. After all, an enemy’s enemy is a friend. There is nobility in truth, even if it hurts – Sati. People have a tendency to do what they want to do rather than what they should be doing – Gopal. Sometimes, for the sake of the larger good, one has to do things that may not appear right at the time – Karthik. For history is written by victors. They can write it however they want. The losers are always remembered the yway victors portray them – Kali. If there’s a victor’s version of events, then there’s a victim’s narrative that survives equally – Gopal. A man becomes God when his vision moves beyond the bounds of victors and losers – Sati. There is always unity at the end and it brings a new tranquility, But the meeting of two worlds causes a lot of temporary chaos – Ganesh. But an inspiration before its time appears like a rebellion – Mithra. Circumstance is just an excuse for the weak to rationalise their failures – Sati. Delusions create the most compelling of beliefs. Vengeance is a waste of time. Don’t surrender to anger. Surrender only to dharma – Sati. This is a nice book and it gives an apt ending to the awesome Shiva Trilogy. Fast paced, logical, gripping. Although I found that some parts of the book are a little stretched out, than it was necessary. But overall the content is good and worth reading. Amish keeps amusing you with plot twists and turns. The books also changes your perspective on the mythological things that you’ve been reading/learning from your childhood.